The moment every "Star Wars" fan has been waiting for happened Friday -- the Celebration panel for "Episode IX" was held in Chicago and featured interviews from the cast, secrets from the film and much more. At the end of the afternoon, we would not only have a title, "The Rise of Skywalker," a teaser trailer, but the possible return of the greatest villain "Star Wars" has ever known. The panel began Friday afternoon with a standing ovation for host Stephen Colbert, as the moderator ran around the stage in utter excitement. The life-long "Star Wars" fan told the audience to sit down because they had an exciting hour ahead of them, and, boy, was he right. Lucasfilm president Kathleen Kennedy and director J.J. Abrams were the first to the stage. "We're so excited, because I think what you're going to end up seeing something you're going to be so happy with," Kennedy said about the upcoming film. "We cannot wait for you to see what we are cooking up," Abrams said. The duo spoke about this movie being the absolute final movie in the Skywalker saga, finishing the run of Luke and Leia that Mark Hamill and Carrie Fisher started more than 40 years ago. "In addition to being the end of three trilogies, it also has to work as its own movie," Abrams added, saying that it's also about "the new generation." The untimely death of Fisher in 2016 and filling the void of Leia was also a topic of discussion. "She was the best, she was glorious," Abrams said. "We all just loved her. ... The weird miracle [is we had] a number of scenes from 'Force Awakens' that were unused." He said they never thought of having a CGI character and went with the idea of using that unsued footage and "writing scenes around her." "Princess Leia lives in this film," he said. Some time has gone by in this film since the ending of "The Last Jedi," Abrams added, and this "is an adventure the group goes on together." Classic cast members like Billy Dee Williams and Anthony Daniels also took the stage to talk about the legacies of their famed characters, as well as their return to the big screen. Fans saw a picture of the return of Lando Calrissian to the trilogy. "I get sick and tired of being accused of betraying Han Solo," Williams joked, to a loud applause. "He was up against Darth Vader." Next, Daisy Ridley, John Boyega, Oscar Isaac and more of the new cast took the stage to talk about the upcoming film. "On this adventure, I think Finn has found his footing and his role within the Resistance," Boyega said about his character. He added that there will be closure for him on things like love, family and more for the former stormtrooper turned hero. "Finn is single and willing to mingle," he joked about his role in the last film and whether he will end up with Rey, Rose or anyone at all. Ridley spoke about her role, too, as the possible leader of the next wave of Jedi. Daisy Ridley stars in Lucasfilm's, "Star Wars: The Last Jedi." A new photo of Rey and her staff was shown, igniting another round of applause and gasps. "The lightsaber that Rey inherited from Luke lives," she revealed after the events of the last film, where it exploded while her and Kylo fought over it. 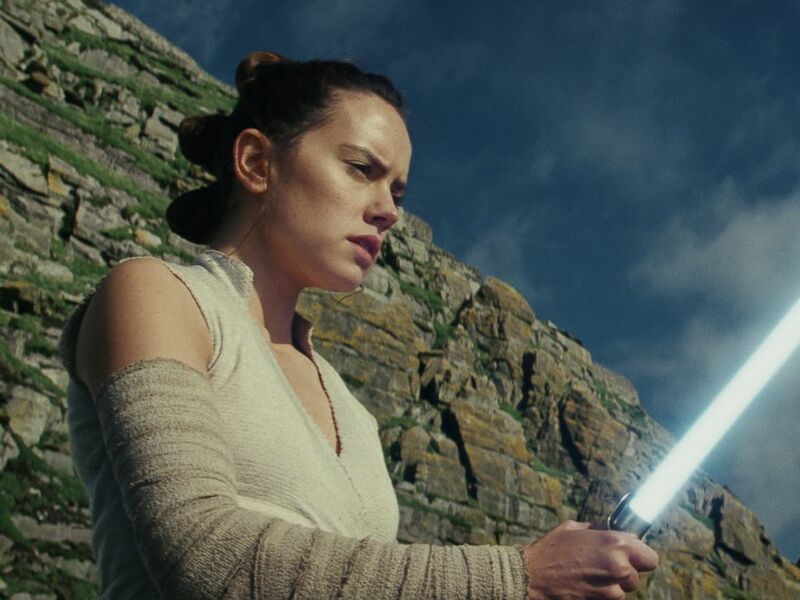 Abrams says there are "some extradorinaiy" things Daisy and Rey do in this movie, which means she may be even more powerful than we saw in "The Last Jedi." Of course, Ridley was asked about her and Kylo and where that relationship is going. "We'll have to wait and see," Ridley said. "I think I can confirm, there are no more semi-naked Kylo [force visions]," she added, joking about the last film. A new droid, Dio, was introduced and the little creation spent a few minutes chatting with BB-8. The panel ended with the biggest part of the day, a teaser trailer! The clip opens with Rey in the desert, taking out her lightsaber, hearing Luke's voice, even though he died in the last film and became one with the force. She's ready for action and looks to be going head on with an enemy speeder. Next, we see Finn, Kylo, Lando and others in a montage of amazing action. "We'll always be with you," Luke says. "No one is ever really gone." We see Leia as well, embracing Rey. And a title -- "The Rise of Skywalker." We also may see a glimpse of the Death Star on the ground, while a familiar laugh was overheard, but it couldn't be the Emperor, could it? Ian McDiarmid, who played Emperor Palpatine in the prequels and original trilogy -- when he was tossed into the maw of the Death Star by Vader in "Return of the Jedi" -- then came out and told them to play the trailer again! Is he back? That's not clear, but with Luke's words, it's possible.